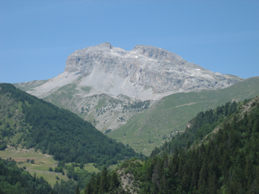 I climbed this fine looking peak out of Praloup in the Ubaye area in Southern France, where I was spending a week with Catherine and some friends. On the last day, I got up at around a quarter to five in the morning and started hiking near the back of the cabin that we were staying at. A couple days before we had already explored the first section of the trail and I made quick progress walking up the forest road. Eventually, the trail served of to the right and I enter unknown territory. It wasn't quite bright yet, but the first sunlight was visible on the horizont. Luckily, the trail was not too faint and I soon switchbacked my way up the mountain and rapidly gained elevation. It was completely still, without any wind or other noises until the first birds begain to twirp. About 90 minutes after setting out I reached the boundary of the ski resort and aimed at the top ski lift. On an exploratory hike a few days earlier I had had a nice view of the summit and thought that there might be an easy traverse from the ski lift summit to the base of the Grand Seolene summit. I was right and there was even a traverse. The last 400m or so of the mountain consist of a steep face that from far away looks too difficult to climb without gear. However, when approaching I was able to make out some obvious ledges that led up the face and eventually turned into territory that was less steep. Once I arrived at a point just 50 meters below the summit it became clear that there were two summits, and from my vantage point it wasn't clear, which one of the two was higher. I decided to do both of them and did the easier looking one, the right one, first. This also turned out to be the high point. The summit offered nice view of the Chapeau du Gendarme, which I had climbed with Catherine a few days earlier and of the higher Alpian peaks to the North. A cross marked the summit as so often the case in the Alps. I stayed for 30 minutes or so, basking in the sun light and admiring the beautiful peaks, most of them higher to the North. Then I headed down a different route, which turned out to be a bit tricky, as there was no trail and some routefinding had to be applied. I headed down various chuts just to turn around to find another one that looked more feasible. But eventually I left the rocky area and walked across lush mountain meadows down to the street where Catherine was supposed to pick me up in the car. Lots of flowers were out at this time of the year, which made the hike very enjoyable. I reached the street, and briefly contemplated checking out a nearby abandoned village (and church), but then decided to walk towards Praloup in order to meet her. Unfortunately, the cell phone wasn't working and I had to walk for some time before we found each other.